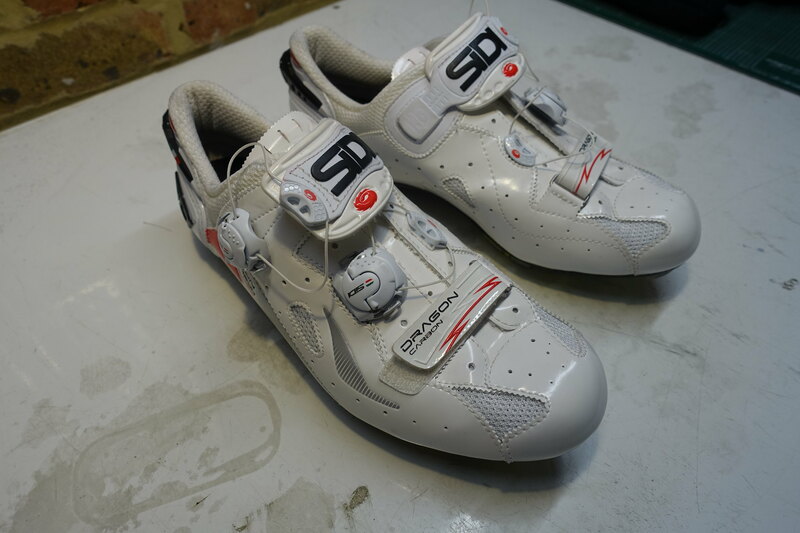 For sale, Sidi Dragon carbon Mega, white, size 44, the Mega gives you a little more room in the toe box. Looked for a pair of these in my size for ages, finally found a pair and after one 20 mile ride (EDIT: now 2 rides) I'm pretty sure they're not gonna work for me. Disclaimers, I've trimmed the excess of one of the arch compression straps to stop it from catching on the crank arm and irritatingly I've put a small scuff on the toe on one shoe. 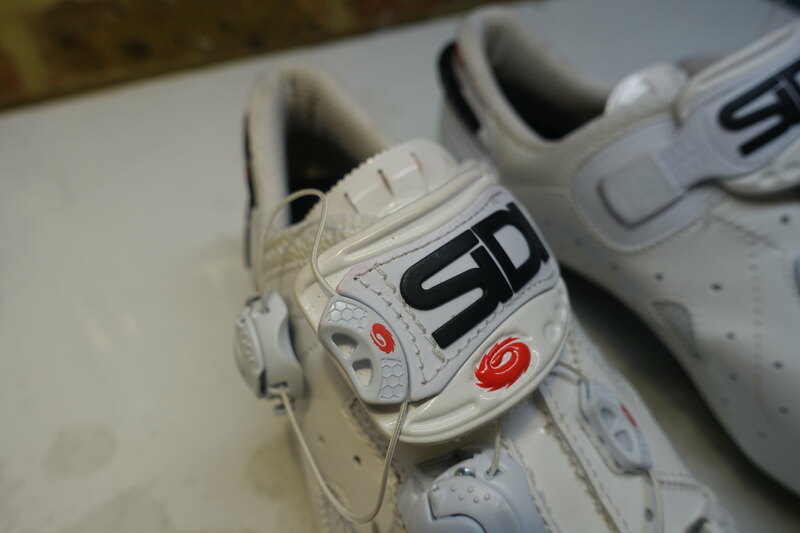 Also, they were supplied in a scruffy non original Sidi box. Otherwise these are mint, inner soles untouched, the photos make the inner look a little beige but they're icey white. 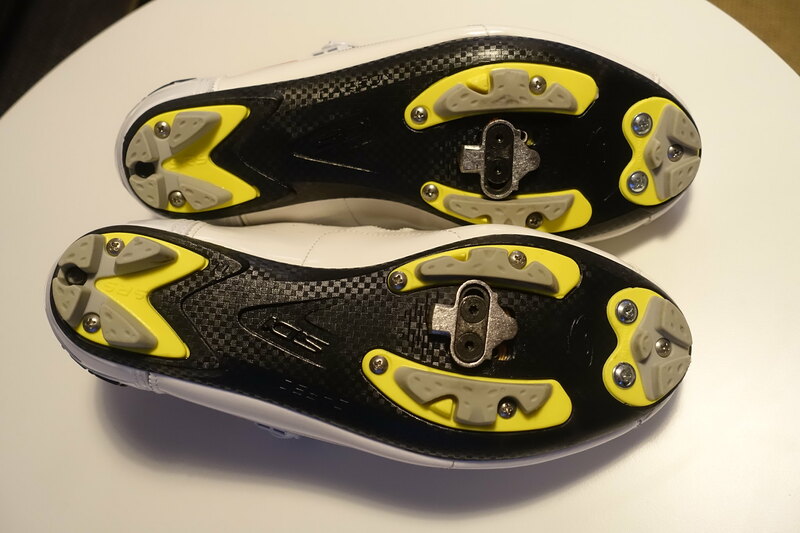 Photos show with cleats bit these have now been removed. Viewing possible in either Sydenham or Clerkenwell, £130 > £115 > £100 collected, or can post at cost. Swap for a pair of bonts? Provisional dibs. Will double check size when home. @mcvw thanks for the offer but not looking to swap. Keen, if I can meet for a try on. 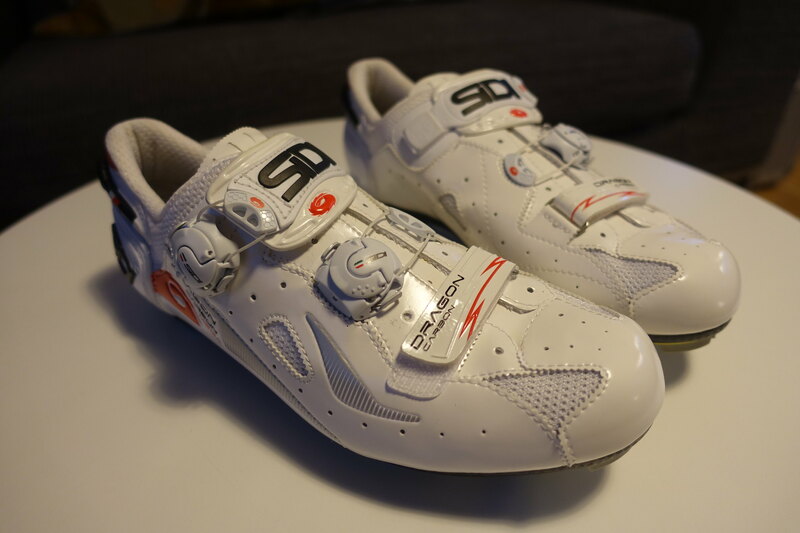 I am between a 44 and 45 in the new Sidi Sizing. Bumping these with an update and price drop. After deciding to try them again i thought it'd be clever to use my shoe covers to protect them. One 10 mile ride later there is now some very minor red staining visible on the tongue slits (oh how i laughed...) and i'm sure these shoes won't work for me. I'll stick a close up pic of the marking later but i've dropped the price to £115 to suit. Couple pics showing slight red staining around tongue from show covers, it's very minor but only fair to disclose. Still in excellent condition and Always Riding doing snazzy arch strap colours for £5! if these are still around next tues (19/3) I cld come to clerkenwell and check out sizing. early afternoon ish? Couple failed attempts means these are still up for sale. Dropping the price to £100 before i shift them to Ebay.